BiOrb offers one of the most interesting aquarium packages, complete with matching kits plus accessories and all these are made specially for those aquarist who intend to keep it simple with a space-saving tank design for their homes. Interesting enough, if you search carefully and browse across the web, you will also find that they are also among one of the well-known fish products which receives its fair share of criticisms leveled by die-hard hobbyists who regard them as a provider that place importance toward the design and compactness above all rather than the pet fish’s welfare. However, to be fair to them this only holds true under certain conditions and scenarios. Product ranges related to the brand are mostly mini-sized setups having the capacity below the 10-gallon limit. Some even go as small as 4 gallons like the Baby BiOrb tank which by itself is quite famous among parents looking to get something new and easy-to-manage for their kids. But one thing that they often forget is that with the aquarium so small, one should never make the mistake of getting a pet which can outgrow the size of the tank! Baby BiOrb are meant only for small fish and before we proceed further, let’s not forget that putting goldfish in it is definitely out of question here. If you really understood about the fish, you will know that depending on the species, some can easily grow beyond 3 inches in length. Thus, I would suggest you read up further about goldfish in details before you make up your mind and heading to the store. On the type of fish to choose, you can also read up on getting small pets for your tank. Hopefully all these will provide you the necessary information on what to go for and expect in the long run. 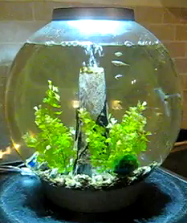 BiOrb shapes and also the overall quality are the winning plus points on why some people prefer it over the conventional square or rectangular fish tank. Compared to the others, the glass for the aquarium is one of those special-made that projects a clear and high transparent rating see-through type allowing you to view flawlessly into your tank. Other matching additional accessories which you can get to decorate and make it a complete set are the acrylic stands and having one would definitely project that kind of modern look into your homes. However, needless to say with that kind of quality comes along with it the hefty price tags that are often above the premium range. Most people would describe it as being overpriced, however I will leave that to you to make your own judgment. Other interesting aspects about the fish care brand is that all the packages have with it, its own lighting and undergravel filter so that you can instantly setup the tank without much fuss and hassle. One of the negative points related to having the new fish bowl is on the maintenance aspect. Don’t forget that every pet even for a small one will generate a lot of waste and unless the aquarium has been fully cycled, the water can get cloudy very easily making it a bad experience that you will want to avoid at all cost. Most of the problems related to the management of the BiOrb are the water parameters and even with the filtration system at maxed out performance, most of the time you will still face difficulty trying to keep the nitrite and nitrate under control, as fluctuation in the levels are often at the extreme side. If your intention is to setup a marine aquarium, then I would suggest you avoid using the BiOrb because it will get even harder especially when saltwater fishes are more sensitive to slight changes in the environment. As mentioned, with such a small range to play around, it will only make life difficult both for you and your fish. In conclusion, finally whether you decide to get one or totally forget about your plans, it all depends on what you want in the first place. If design and contemporary looks are what you are searching for to decorate your home, then BiOrb is definitely suitable for that but however, if caring and raising a healthy fish is your main concern and objective, then by all means go for full large-scale aquarium tank.